The ecommerce landscape continues to get more competitive. It is becoming increasingly difficult to base your success simply on having a site with great products and no other content. You might need to develop a broader strategy to engage your customer base. One tactic to consider is incorporating educational content — related to the products you sell — into your site. Rolling out an educational section or resource center with tips, tools, and wisdom takes time, and a bit of talent. But if your products — and the product-buying decision — require additional knowledge, the time and investment can be well worth it. For inspiration, read the “Learn at REI” section of that retailer’s website. It contains helpful articles, videos and online classes — all to promote outdoor activities, which are related to the products REI sells. 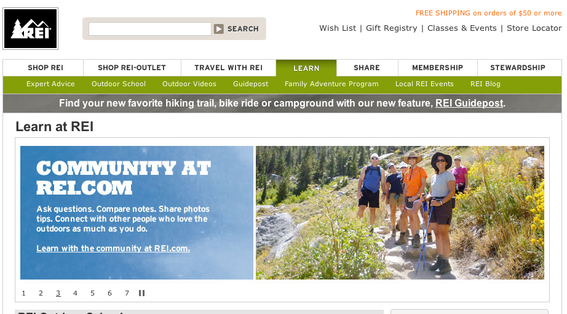 REI’s “Learn at REI” section promotes outdoor activities. Here are 10 pointers to help you build a resource center that will be both valuable for customers and will contribute to driving more traffic to your site. I have included links to free tools that will help. Aim for consistent updates. As with a blog — which could be a key part of your customer education strategy — coming up with fresh and timely content is essential. Think of yourself as a publisher and create a production schedule that is realistic. Posting a publication date with each article or resource will help your audience know the timeliness of your information. Publish in multiple formats. Some people love to read articles. Others respond well to short tidbits of information. See if you can vary your format as well as utilize audio and video technologies. Practical eCommerce has some helpful video creation articles to help you get going. Cross-link articles and videos. Much of the content you create could be helpful in nudging customers through the buying process. Link from your product pages to the relevant resources — and vice versa — or post some of the resources directly on your product pages. Highlight content on home page. All of your hard work could go for naught if your site visitors don’t see the content you have created. If you have an announcement section on your home page, link to your newest resource center entries as publish them. Invite users to contribute. Coming up with a continual flow of content is challenging. Your customers might be willing to help in the job. You could reward them with a shopping coupon if they contribute an article or video. Use RSS for other channels. Push your content to social media platforms. The most efficient way, assuming your ecommerce platform supports it, is to output content as RSS and distribute your feed files using one of the many tools like Twitterfeed. Your social media efforts could fall flat if all you are doing is pushing out product announcements. But your resource center announcements can be a helpful supplement. Tools such as Twitterfeed help distribute your educational content. Utilize a comment system. Encouraging customer engagement is always a good thing. One easy way to do so is to install a comment system like Disqus on your site. Installation is easy; you can have a site-wide, managed comment system with very little effort. Remember SEO. In addition to providing valuable information for shoppers, a site resource center can be good fodder for search engines. Remember search engines when you are writing the content and developing your page titles. Make it easy to share. Add a social widget to your site that encourages users to share your content on their social networks. AddThis and ShareThis are easy to install and will display the social media icons that users recognize. Remind your customers. As part of your order follow-up strategy, remind your customers that your educational content can help them. If you send emails to them after you have fulfilled their orders, include a link to a new article of interest to encourage them to revisit your site. To embark on new a resource center, consider the following paths. Use your ecommerce platform. Your ecommerce platform likely has a content management system that will meet your needs for deploying rich content. Discuss your plans with your platform provider for suggestions and direction. Whichever path you choose, prepare to work through some technical glitches as you get started. But once you gain experience with publishing content, you will be on your way to having a compelling site that brings your users back to benefit from the educational information you have to offer.